Maer Wilson is a talented writer who generally focuses on middle grade and young adult fiction. This short novella is a fine example of her talent. The plot is told from the point of view of Fiona (Fi) who is a budding young detective about to finish college. She is ready to launch an agency with her fiance, Thulu. There is one strange thing about their business; their business will be involved strictly with clients who have already died. Together Fi and Thulu are able to see and communicate with the dead. 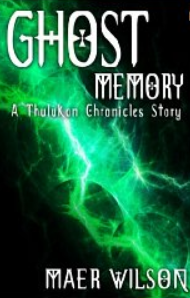 Thulu and Fi met at the age of ten shortly after Fi’s parents were killed in an accident. At the outset the reader is introduced to Fi when she breaks the nose of a student in karate class. She feels badly, but soon perks up when she sees a “client” outside her door. Peter Swanson engages her to find the money he has hidden in his former home for his husband, Donovan. The next day, the two sleuths visit Donovan at home, while Peter assists Thulu in finding the money. They discover that some of it is missing. Fi and Thulu use their detective skills to solve the mystery and convince the thief, by some rather unconventional methods, to return the money to Donovan. Wilson is an excellent writer. She weaves the plot skillfully and manages to delineate her characters’ personalities in the span of a few pages. The reader develops an affinity for them as well as an appetite for learning more about them and their adventures. Wilson gives the readers a taste of what is to come in Relics at the end of her e book. I believe most readers will want to continue reading about these characters in this series. This book would be appropriate for teen readers as well as adults. Whether or not you enjoy paranormal works, I think you will want to look at this series.